After listening to The Blinding Knife, book 2 of Brent Weeks’ epic Lightbringer saga, I decided to jump right into book 3. Honestly, with the cliffhanger ending of book 2, I really had no choice–I had to find out what was going to happen. Overall, I don’t think The Broken Eye was quite as strong as The Blinding Knife, but it was still very enjoyable. The overall plot didn’t really move forward all that much. 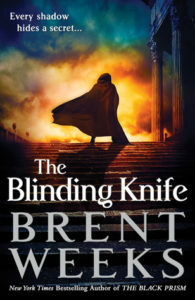 The events of The Blinding Knife required some amount of regrouping and rebuilding on both sides of the conflict and The Broken Eye was set during that period. What that meant was a lot of setup and a focus on the main characters and plots surrounding the Chromeria. But what it also meant was very little focus on the conflict with the Color Prince. I guess what I’m trying to say is that I liked the novel and I enjoyed spending more time with the characters (because they are pretty awesome across the board), but I was a little disappointed that the battle with the Color Prince was so downplayed. I’m also not sure how I feel about Gavin’s storyline. Gavin’s story was interesting and engaging enough in its own right, but it was so separate from everything else–it’s almost like Weeks was looking for a way to sideline Gavin for a while without killing him. That said, the ending was outstanding. Weeks did an amazing job setting the stage for book 4 and ensuring that his ravenous readers would stick around to read it. Personally, I’m really glad that it’s coming out next month so I won’t have to wait long to dig in! I read the first in the Lightbringer series, Black Prism, three years ago. I enjoyed it for the most part, but I wasn’t immediately sure if I would continue the series. Eventually, however, I grabbed the audiobook for The Blinding Knife and I’m glad I did because it was definitely a step up. I’m not sure if Simon Vance’s brilliant narration was the main difference or if the story/writing improved, but I definitely enjoyed book two quite a lot. That said, while I liked the book as a 32 year old man, I probably would have loved it as an 18-year-old, maybe even a 25-year-old. There were a few “slightly juvenile” bits that didn’t work as well for me today that I probably would have enjoyed (or wouldn’t have noticed) when I was a bit younger. All in all, Brent Weeks did a great job telling an exciting and enrapturing story. I really like Gavin as a character and Kip was a lot less annoying, even pretty likable, in book two. There was this scene where a girl creeps in Gavin’s bed and he thinks that it’s Kariss. When he realizes that it’s not, at exactly the same time that Kariss actually comes into the room to seduce Gavin herself, causing Kariss to flee, he flies into a rage and murders the girl. Admittedly, Gavin is horror struck and seeks to punish himself, but without much ado, the whole matter is pretty much written off and Gavin is given a reprieve for various reasons, most notably that his colors are out of sync, which may be causing him to behave erratically. Eventually, he apologizes to Kariss and they get married. From a plotting standpoint, little is actually accomplished with this, because if the girl hadn’t been there, Gavin would have just ended up with Kariss sooner (although maybe this was necessary for Gavin to deal with Dazen). But from a moral standpoint, holy crap, how can everyone just let this go so easily? When our protagonist, who isn’t perfect but is generally pretty moralistic, murders someone, it’s a big deal. I mean, he should probably have gone to prison, but instead he was forgiven in nearly the blink of an eye because the girl was a bit of a “slattern” and he’s the Prism. As you can tell, I did not like this scene. It didn’t seem fitting for Gavin’s character and it was really pretty insulting towards that poor girl and women in general. I wish it wasn’t in the book because I don’t think it added anything of value. I still gave the book 4 stars, but perhaps it would have been 5 without this incident. I picked this up when I came across the Kindle edition for $2.99. I had read Brent Weeks’ Night Angel trilogy and found it to be very entertaining so the price seemed like a great deal. After reading the The Black Prism, I can definitely say that it was money well spent. I believe that the greatest strength of the novel is the magic system. The whole thing is color-based. Magic users have the ability to harness one or more colors in the spectrum and each color has unique properties. The magical by-product is called luxin, which can be shaped and conformed to the user’s will. I also liked that magic took not only a physical tool on users, but a mental toll as well. Although it’s different in many ways, the detailed structure of the magic system reminded me of Brandon Sanderson’s Mistborn. I think having such a well developed system helped strengthen story and enriched many of the characters. The characters themselves were not my favorite part of the novel, although I’ll admit that I really enjoyed the perspectives of Gavin and Dazen. They easily made up for the other somewhat lackluster characters, including our “unlikely hero,” Kip. I’ll give Weeks some credit trying to mix up the standard conventions by making Kip overweight, but, really, most of the other tropes still applied and I didn’t find him to be particularly compelling. And, when you think about it, it didn’t really even make sense for his character to be overweight, considering his lifestyle, but whatever. As I mentioned, I was really drawn into the story lines of Gavin and Dazen, especially the glimpses back to the False Prism War. However, the “real time” story was just okay. I thought the enemies resolve was a little thin. Sure, it made sense, but it just seemed unlikely that no one was aware of the buildup of this huge army full of magic users. I apologize for the random tangent, but I feel compelled to mention something that I found to be very strange. I’ll be damned if I could understand why Weeks put so much effort into describing each and every nation’s typical skin and hair colors. Not only was it impossible to keep straight, but I couldn’t even identify half of the colors he referenced. My guess is that Weeks was trying to create a multiracial universe, but I’m not sure that he really needed to sell it so hard. Okay, so there were a few things that I didn’t really care for, but overall I enjoyed the novel. It was probably more of a 3.5 stars for me than a solid 4, but I rounded up. If you are looking for an interesting magic system or you enjoyed Weeks’ Night Angel series, I suggest you give this a try. As I mentioned in my previous post, 2011 was an awesome year for me when it came to reading. I read and listened to some really fantastic novels and I wanted to give them a little more credit than I was able to before. One my favorite podcasts is the Sword and Laser, a science fiction and fantasy-themed book club, and the hosts continuously lauded Abercrombie’s first fantasy trilogy. After such glowing praise, I had to check it out and, damn, I’m glad I did. The First Law Trilogy is what they refer to “post modern fantasy,” which I guess means that it’s grittier, grimmer, and somehow more realistic than the high fantasy of J.R.R. Tolkien and his contemporaries. As it turns out, I loved that style. The characters were flawed, there was no clear line between good and evil, and the plot was an intricate weave of politics and gruesome warfare. Plus, it featured one of the most awesomely vicious characters I’ve ever come across: the Bloody Nine. Now, this trilogy isn’t for the faint of heart. If you don’t like blood, this series isn’t for you, but, otherwise, it’s a great modern fantasy trilogy and I recommend it highly. Believe it or not, I actually followed Pat’s blog for several months before I picked up The Name of the Wind and, in that time I learned something: Pat is an awesome dude and he writes a very honest and sometimes very humorous blog. So, going in, I had pretty high expectations and I wasn’t disappointed. The Name of the Wind was amazing…I absolutely loved Kvothe’s adventures. Now, I actually timed this out pretty well and finished the first novel right as the second was published and as soon as I finished The Name of the Wind, I tore into Wise Man’s Fear. Rothfuss’s second novel was also very good, but, despite it’s massive acclaim, I actually liked the first novel a little better. Regardless, I cannot wait to see how the story ends! The Kingkiller Chronicles are highly recommended. I actually picked up the whole trilogy on Amazon.com for no other reasons that I had heard of the author and it was a great deal. As it turns out, it was a steal! Although it was the last book I read in 2011, I’m pretty sure The Way of Shadows was my fastest read of the year. I just could not put it down. 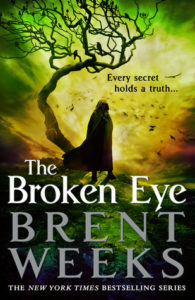 I’m currently reading the third book in the trilogy now, but I would already recommend it highly to any fantasy reader. One of my reading goals of 2011 was to try out some new authors (I actually tried out many new authors), but I was especially eager to find out what the big deal was about Neil Gaiman. After reading The Graveyard Book, Neverwhere, a couple volumes of The Sandman, and, most importantly, American Gods, I think I understand. Neil Gaiman gets fantasy. His writing perfectly embodies that sense of awe and wonder that truly make a story a thing of magic. The bottom line is this: I’m really glad I found Neil Gaiman this year. If you haven’t read his works, seriously, you need to get on that! Well, I think that’s all I really wanted to say. I don’t know if 2012 can top 2011, but I’m up for the challenge.